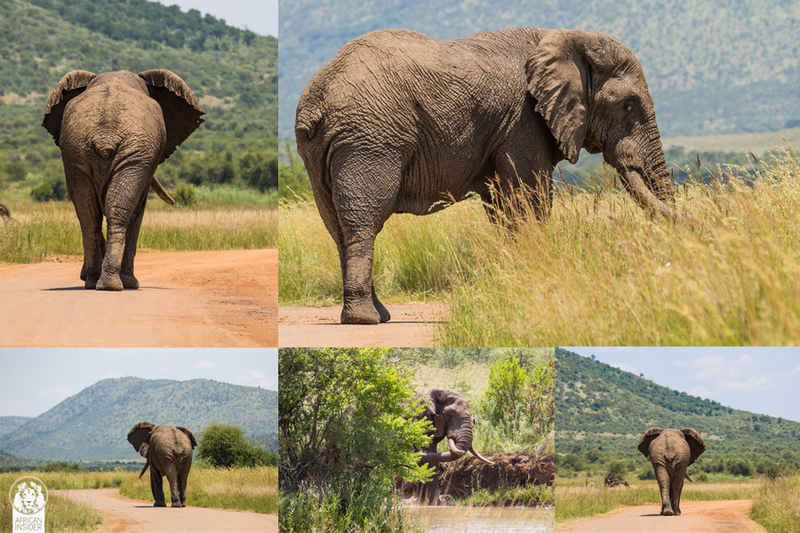 This past Tuesday, 10 February 2015, during a private guided African Insider day trip to Pilanesberg, we got to spend some time with this amazing and massive bull elephant, Amarula. This particular bull achieved national stardom thanks to his car bullying antics, which have been documented on two occasions in recent years. The behavior was brought on by the Musth cycle of sexually mature bull elephants. During Musth, bull elephants go through a phase of heightened hormones and are in search of females to breed with. Musth in elephants can result in more aggressive behavior and shorter tempers. Amarula has a majesty about him which everyone notices. “He walks as if he owns the entire reserve”, commented one of our Israeli guests. Spending time with this mischievous, impressive giant made me think back to his story of arrival in Pilanesberg and several other of his giant colleague’s. These large bull elephants were brought in from Kruger National Park to sort out some troubling behaviour from naughty juveniles. In 1979 Pilanesberg was proclaimed as a national reserve and more than 6000 animals were introduced in the largest translocation operation to date known as Operation Genesis. Since that time our knowledge of elephant behavior has grown immensely but some hard lessons were learnt in the process. The elephants introduced to the reserve were most often orphans of culling operations. The reason these elephants were chosen is that the orphans were still small and easier to translocate. The translocated juveniles formed large groups, were very secretive and avoided human contact, often showing aggression to humans. (Slotow & Van Dyk 2002). The subsequent introduction of family groups had a positive effect and the majority of juveniles integrated with the herds and became less secretive. The reserve was, however, still without fully mature bull elephants and a strange dynamic developed amongst the younger bulls. Without their larger role modes to teach them the ropes, the younger bulls were behaving badly, bullying females and trying to force them to mate. The young bulls were going into musth (heightened hormonal state) 10 years earlier than elephant males normally would. Their resultant behavior was worrying with the young elephants becoming aggressive and attacking rhinos and numerous tourist vehicles resulting in 40 dead rhinos and one human fatality. The youngster’s frustration was as a result of rejection from females. The females recognized that the young bulls were not yet fully mature and would not mate with them causing some severe reactions from the youngsters in their heightened hormonal states, which resulted in the rhino deaths and other aggressive behavior. A solution was found in 1997 when the massive and ground breaking task of relocating fully matured elephant bulls from Kruger National Park was undertaken. No small feat considering a mature bull can weigh over 6 tons and stand taller than 3,5 meters at the shoulder. The result… once the larger bulls had settled and made contact with the other herds they quickly asserted their dominance and the young bulls took their rightful place amongst the elephant hierarchy and behaved accordingly. With the larger, stronger elephants there to teach the youngsters correct “etiquette”, musth cycles of the youngsters retuned to normal and the incidents of rhino killing and tourist vehicle attacks were completely diminished. Perhaps this is a lesson which, South African president Jacob Zuma should heed ahead of tonight’s State of the Nation Address in South Africa. With delinquent young bulls in the midst of parliament, perhaps all that is needed is some leadership from the older bulls. Maybe then, the “elephant in parliaments room” would not exist or need to be addressed. My family have been regular visitors to the Park Since 1980 . Always stayed in the Mankwe Tented Camp with 2 sons . Now we are blessed to have their children able to enjoy and every school holiday we visit . My wife and I spend additional time with a week in June and a week in November. We have taken friends and business guests to the park . Amarula and the other 4 Bulls we had the pleasure of seeing in 1 day after their release . have had more than one close encounter with the tail less one and we always treat him with the greatest respect. My twin boy grandsons know him to be the naughty elephant having been with us after he chased us a couple of times. It has been and will remain a place of wonderful memories for my family never tire of visiting and something new on every visit .